The District Railway was designed by a committee with impractical aspirations. A banking crisis and collapse of one of its contractors during construction created long term financial difficulties. It was complicit in completing the long hoped for ‘inner circle’ railway that was a financial disaster and very difficult to operate. Its directors were for many years ineffectual and its managing director, though getting off to a good start, became complacent and distracted and failed to pursue with vigour the policies that were needed. Even the American entrepreneurs, who arrived with the twentieth century, had their work cut out trying to make something of a line that rarely paid dividends and had never been far from bankruptcy. In all this, the railway and its operational staff provided good and useful services to important parts of London or the suburbs it helped to shape. 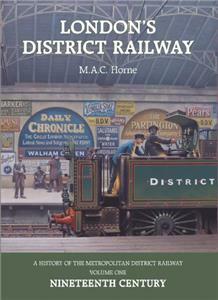 Why a railway like this found itself in such a sorry state is part of the story covered in this definitive volume. Well illustrated in colour and black and white.